FZ07 Sport tourer- Tracer 700 is here! Thread: FZ07 Sport tourer- Tracer 700 is here! As per the spy pics, a FZ07 sports tourer has been launched and its probably coming here too. Now, next step is the ADV machine..good times! That is the ultimate around town bike. Not nearly enough power for me, as far as two-up or bigger, faster roads go but perfect for commuting and ripping around. I really hope they do a proper ADV version. Currently : 2015 FZ-09 and 2008 FZ-1 .... 2006 TTR 125 pit bike as well. I like it. I think Yamaha has a winner with this bike. 60lbs lighter than the Weestrom. Looks like a nice little commuter. I guess I don't get it. You're dropping 30 hp and adding approx 15 lbs relative to the FZ-09 and paying more? Nice looking bike, for sure, but so is mine now that I have it the way I want it. Last edited by Tigershark; 04-21-2016 at 09:55 AM. Well, its the ST version of the MT07- like the FJ09/Tracer is for the MT09 which costs around 10K. It gets extra goodies, is comfier, roomier (?) - though dont think TCS made it to this bike- and some people want those extras for traveling or commuting. I am pretty okay touring on fairing-less nakeds but others aren't so....different strokes for different folks. It's officially on the Yamaha UK website. Tracer 700 from £ 6,299.00 which is still priced lower than the MT-09 ABS which is from £ 7,349.00, but the 2016 MT-09 now has ABS and Traction Control as standard equipment. The 2016 Tracer 900 is now priced from £ 8,149.00. 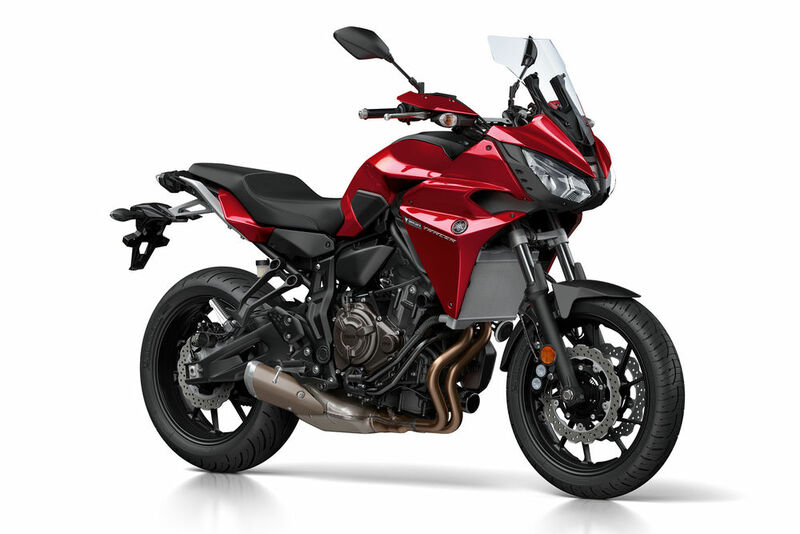 It's hard to say if Yamaha will bring the FJ-07 to North America???? since they haven't bothered giving us the XSR700 here either. Ride to work, work to ride. I know Yamaha is trying to put more on the market to bolster sales and there will certainly be buyers of this bike. If they made it a true ADV that spends 50% of its time off pavement, I think it would be a great choice. A lot of people don't nessasarily want a bike the size, weight and horsepower of the big ADVs being sold right now. Although they're pretty popular. I just don't see where the touring/commuting version of this fits in. The FZ-07 is a great commuter with enough power to more than manage the task, so that slot is filled. And, if you're so inclined, the FZ-07 can be a fun sport bike as well. The FZ-09 offers the power and weight that makes it a very popular sport bike. And the FJ-09 fills the gap for touring. FZ-09 - Lightweight tourer for a tall guy?